August continues to deliver the same doldrums in economic markets that have been present the past three months. Most economic data continues to come in at expectation, producing little effect on the markets. Inflation is coming in at 2.7% year over year, which is above the Feds target rate of 2%. Expect to see inflation beginning to increase noticeably as trade tariffs start to impact consumer prices. Jobs continue to be a strong point in the US economic data points, with jobless claims at an adjusted 45 year low. Wages are not showing significant growth, even with employment levels at a record high. Overall, look for the market to continue meandering in the same pattern for the immediate future. This candlestick chart below covers the past week’s Mortgage Backed Securities (MBS) activity and the impact on interest rates. MBS started the week at 101.72 and closed out the week at 101.75, virtually unchanged as seen in this chart. MBS directly impact mortgage rates, and the days with red indicate higher rates and those with green – lower rates. This week’s Mortgage Banking Associations’ (MBA) weekly rate survey shows effective rates decreased slightly for all loan products, with the exception of the 30-year fixed products. Conforming 30-year fixed remained unchanged and the Jumbo 30-year fixed decreased in rate with an increase in points, so the effective rate is the same as in the previous week. The information below applies to all loans with an 80% loan-to-value. Bankrate’s weekly survey of mortgage and economic experts, countrywide, shows the majority (54%) predicting interest rates will remain unchanged this coming week (plus or minus two basis points), while 18% predicting rates will increase and 27% expect interest rates to fall next week. 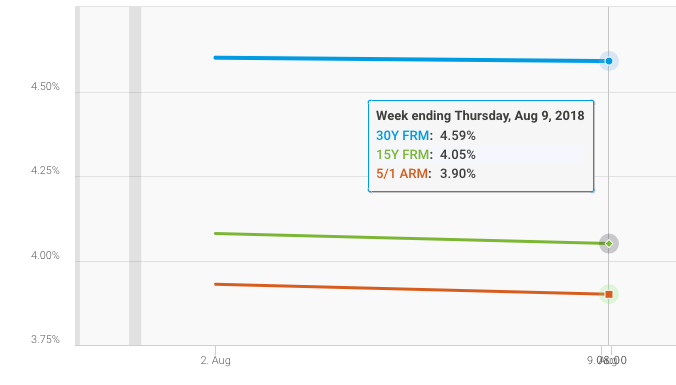 The chart below, from Freddie Mac’s weekly mortgage survey, shows conforming rates decreased slightly over the last week, August 3rd to August 9th, for 30Y fixed, 15Y fixed and the 5/1 ARM. Freddie Mac’s weekly mortgage survey noted, “Mortgage rates have mostly drifted sideways this summer. This stability is much needed for home sales, which have crested because of the multi-year run-up in prices, tight affordable inventory and this year’s higher rates. Going forward, the strong economy will support the housing market, but with affordability pressures mounting, further spikes in mortgage rates will lead to continued softening in home price growth. 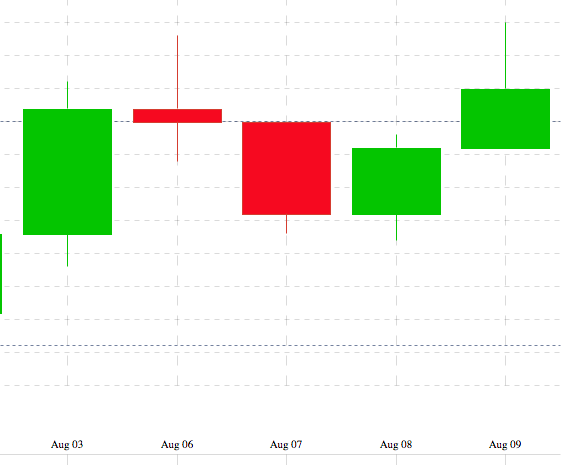 As can be seen in the candlestick chart, rates started and ended the week in the same place. 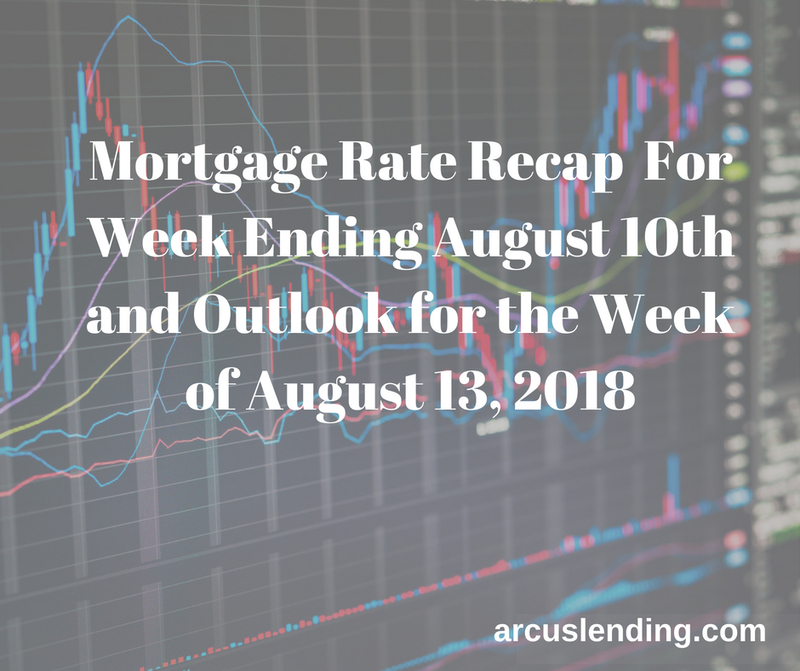 However, floating during the past week would have caused concern as the rates did dip down slightly before regaining ground. Week over week throughout the summer this has been the story. Floating has provided absolutely no upside and the outlook appears to remain in this pattern for the foreseeable future. Best advice is to lock in a rate if you are planning to close within the next 60 days.